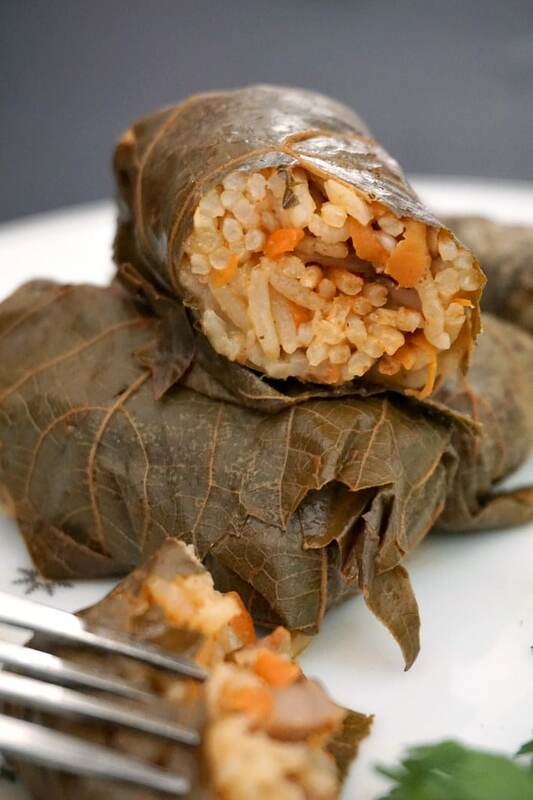 Vegetarian stuffed grape leaves with mushrooms and rice, or Dolmades, a delicious meal for the whole family. 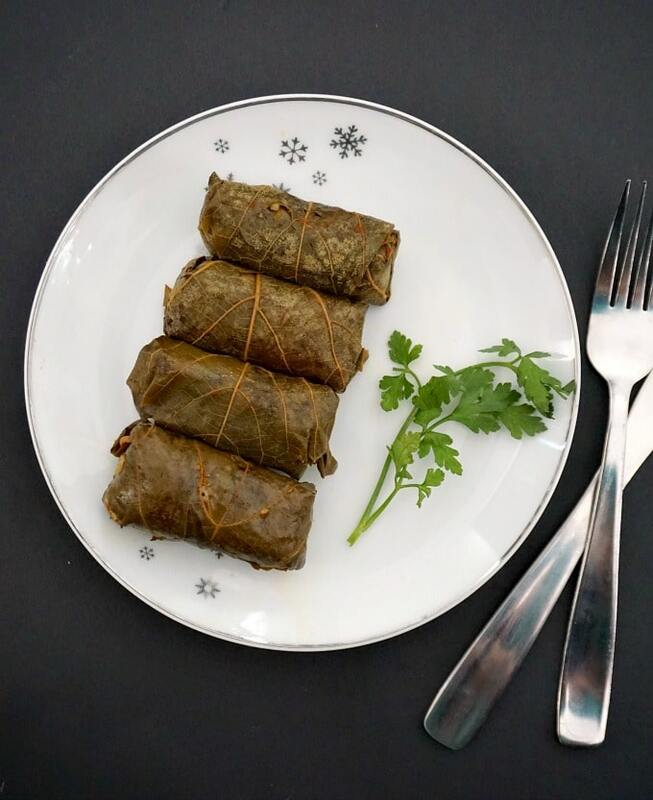 Learn how to roll the grape leaves like a pro and cook a superb dinner so easily with this simple recipe. Only 47 calories per roll. 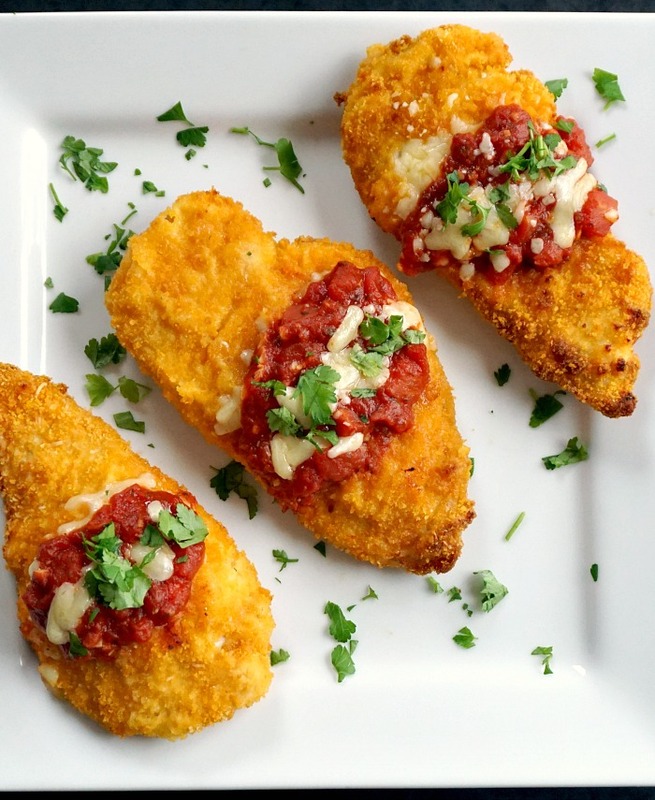 This recipe can easily be turned into a vegan one by replacing the butter with any vegetable oil. I used butter as I think it’s the best possible combination with mushrooms, they release the best flavour you can wish for. As much as I like meat, vegeatarin dishes are far from being boring or tasteless. Take this recipe, it’s easy to put together, and, after a few rolls, rolling will become easy peasy, trust me with that. Now, if you ask me what is easier between rolling with cabbage leaves or grape leaves, the obvious answer here is the grape leaves. Perfect cabbage leaves are hard to find, athough not impossible, and you can make some excellent rolls with them too, like in my Romanian Sarmale. Grape leaves are super easy to use, and really cheap too. I usually find them in the international aisle in my local supermarket, they come in a jar which only costs £1.50, and I get to cook enough for 4 hungry people from one single jar. When you use meat, the mixture makes the rolling easier, as everything sticks together a lot better, but with my choice of vegetarian filling you just have to make sure you don’t overfill, and keep the rolls fairly small. Don’t forget that the rolls get bigger while cooking, as the rice will expand, so you don’t want to make them too big anyway. How to make stuffed grape leaves? 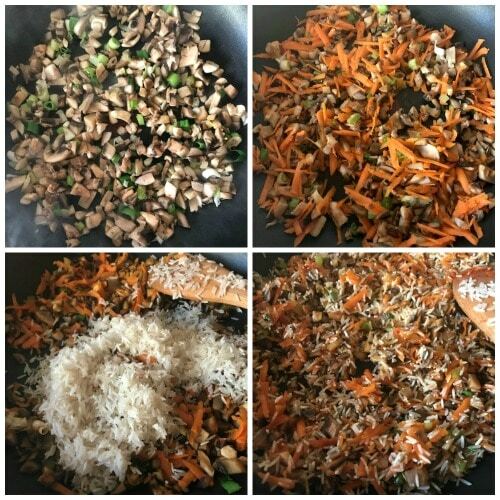 If you want to add any type of ground meat, this does not need to be cooked before hand, just mix it with all these other ingredients. The mushrooms, however, do need to be cooked in advance, otherwise they will release too much water during cooking. SOME TIPS about cooking the rolls. Make sure you use a pan that fits them all, depending on how many you make, you can have one layer of rolls, or more. It s important though to make sure they are close together in the pan, otherwise they might get unwrapped during cooking. It also helps placing a plate on top of the rolls, so the weight will keep them in place, and they will have a nice shape once they are ready. 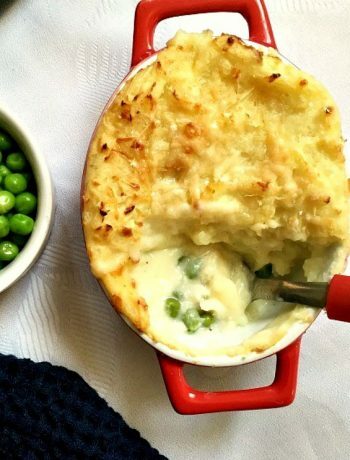 Keep the heating on low to medium, they cook failry quickly anyway, so no need to rush. What to serve with stuffed grape leaves? You can serve they will a nice dollop of sour cream, or Greek yogurt. Also great with some nice polenta, I really must have a separate post on that, polenta is fantastic with quite a few dishes I have on the blog. To reheat the stuffed grape leaves it is best to add them to a pan with a bit of water. I find that in the microwave they do not get reheated evenly, so best to make things easy for yourself. If you’ve liked my VEGETARIAN STUFFED GRAPE LEAVES or any other recipe on the blog then don’t forget to rate the recipe and let me know how you got on in the comments below, I love hearing from you! You can also FOLLOW ME on FACEBOOK, INSTAGRAM and PINTEREST to see more delicious food and what I’m getting up to. 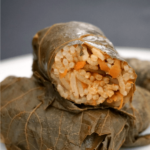 Vegetarian stuffed grape leaves with mushrooms and rice, or Dolmades, a delicious meal for the whole family. 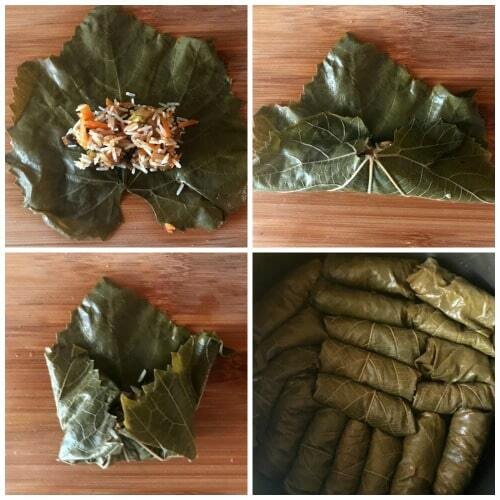 Learn how to roll the grape leaves like a pro and cook a superb dinner so easily with this simple recipe. In a pan, heat up the butter and oil, add the spring onion, mushrooms and carrots and stir for about 5 minutes or until they are soft, and the water released by the mushrooms is evaporated. Rinse the rice with cold water, and add it to the pan, and mix everything well. Season with salt and pepper and remove the pan from the heat. 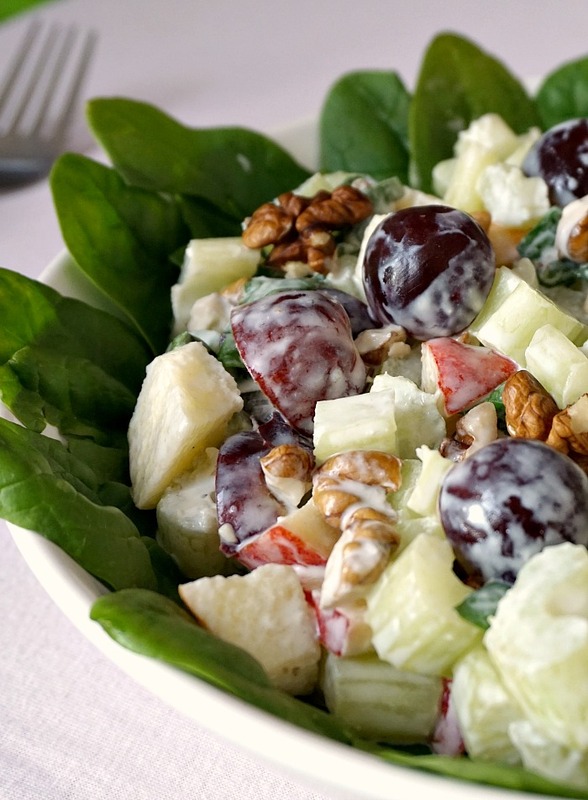 Place about a tablespoon of the rice mixture in the middle of the grape leaf, then roll it tightly. Repeat with the remaining mixture until you use it up. Arrange the rolls in a pan, making sure they are close together. Place a pan on top of the rolls, to ensure they do not get unwrapped during cooking. Mix the vegetable stock with the tomato puree and bay leaves, then pour it over the rolls. Cook on a low to medium heat for about 30 minutes or until the rolls are cooked through.